in an atmosphere of relaxation and conviviality..
services and beauty-up care they need. Our teams listen attentively and are very caring. 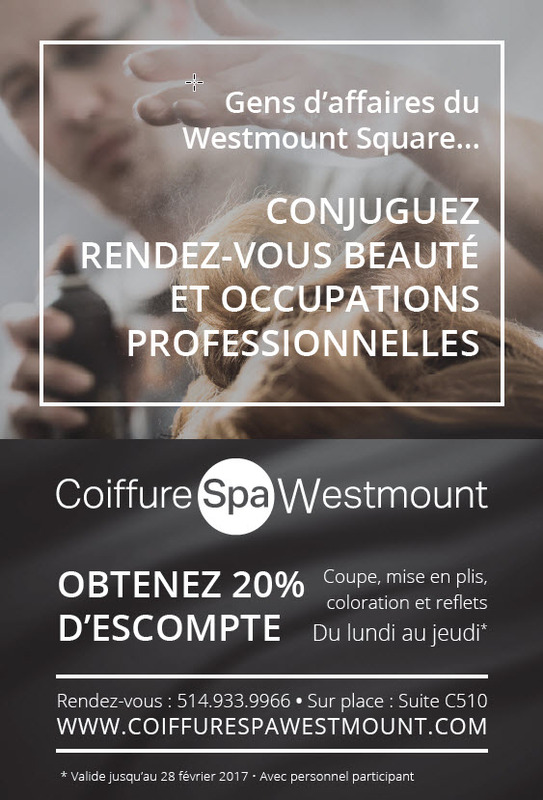 Located in Westmount Square, Coiffure Spa Westmount has provided years of professional salon and spa services. Our elegant spa and salon is the perfect place to go for both men and women’s haircare, aesthetic services, body treatments, and massotherapy. Our hair care professionals take pride in their work and view styling as an art. permanent, relaxer treatment for curly hair, full or partial highlights, tint or natural glossing, and scalp treatment. Regarding your hairstyle, our stylists, colorists and hairdressers listen to you carefully and make you their recommendations and suggestions as to your choice of style. Our professionals have extensive training and are always on the lookout for new trends. Treat yourself to a relaxing and beautifying effect. Our professionals will provide you care that will increase your feelings of appeasement, freshness and radiance. Pamper yourself with our variety of body treatments and aesthetics. Complete your beauty care experience with our professional express service for manicure & pedicure. Whether for a party, a wedding or an important day in the office, enjoy the services of our talented technicians. Discover the palette of colors that suit you best! Our hair care professionals take pride in their work and view styling as an art. 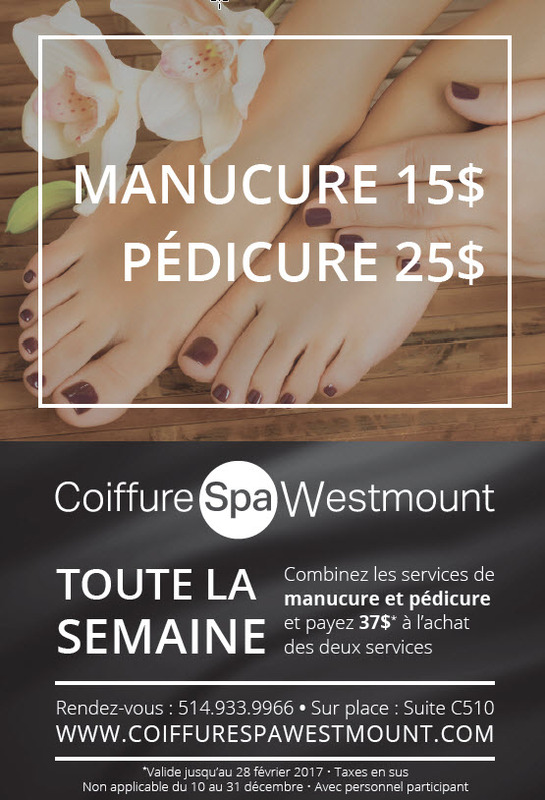 At Spa de Westmount we offer services for both men and women. Our salon services include cuts, updo, styling, permanent, relaxer treatment for curly hair, full or partial highlights, tint or natural glossing, and scalp treatment. Our professional beauticians will provide you high quality beauty treatments. appropriate care for you. Whether for a facial, laser treatment or a hair removal care they are carry out their services with the greatest attention. To eliminate dead skin cells and release impurities. This treatment allows you to relax in a thermal body wrap as the skin detoxifies with a unique blend of seaweed, rich in enzymes and minerals. This wrap helps improve skin elasticity and increase hydration while restoring cellular balance. Much appreciated by people who love scrubs with a grainy texture. This effective and gentle exfoliation treatment for the entire body uses a custom made aromatic scrub “gommage” that removes dead cells and absorbs impurities. Followed with a warm soothing shower, leaving skin satin-smooth. This unique super oxygenating mask delivers high doses of oxygen directly to the skin. Three formulations of bull mask can re-balance any skin type. A deeply nourishing facial treatment designed to strengthen and firm the skins natural moisture balance. Formulated for mature skins needing a “pick me up”. The effects of lifting ampoule are rapid with a super lifting collagen that provides a firming and smoothing effect. Suitable for most skin types. A thorough cleansing of your skin and pores, includes a purifying exfoliant, followed with a calming mask specifically selected for your skin type. While particularly recommended for oily and problem skin, this refining facial will benefit all skin types. Our European Deep cleaning facial treatment can be tailored to a teen’s problem skin by including therapeutic acne treatment. The re-surfacing treatment designed to eliminate dead outer layers of the skin via a higher concentration of alpha and beta acids. Alpha-vital will effectively resurface the skin, leaving it softer, smoother , more hydrated, more uniform with renewed clarity. (sessions 3-4 facials). Gentle vegetable peeling, this outstanding method of removing the barrier of keratinized (dead) cells, stimulates cell regeneration, refines skin texture, lessens wrinkles and fine lines. This relaxing treatment is suitable for most skin types but especially recommended for wrinkled skin, photo damaged skin, acne scars and pigmentation stains. A thorough cleansing, toning , exfoliating combined with a healing essential oil massage. Includes a customized mask to help improve impurities, remineralize and rebalance the skin. Recommended as a service for skin in need of attention or a luxurious skin softening treatment. Special formulate collagen mask. Super lifting firming, this relaxing treatment will benefit most skin types. During your visit to WESTMOUNT SPA | ST-LAURENT TRENDS three (3) hours of parking are offered for free. For your convenience please note that the available parking is underground. Our facility is located in downtown Montreal in the building of Westmount Square, so our boutique is also easily accessible by car, subway, bike or foot. Our Salon & SPA is in the heart of Westmount district and close to the Green Avenue. It is dotted with chic boutiques, superb art galleries, antique dealers, restaurants and bookstores. At the corner of Wood Street, three modern towers of black metal and tinted glass, designed by the architect Mies van der Rohe, dominate instead Westmount Square, a popular shopping center. You are early risers? It is to better service you that we have extended our time slots to better accommodate your planning time. Our SPA & Salon team is on site from 7:45 on Wednesday, Thursday, Friday and Saturday mornings. We start early to take care of your needs: cutting, styling, coloring, makeup, manicure and pedicure services are available.